A break from the Bali travel posts (to avoid this blog from transforming to a Bali Food Blog, instead of a Malaysian one), and allow me to bring you over to the west coast of Perak, to a place posh-ly named the Venice of Perak. Where?!!! Hop over the Dromoz for a satellite view of the aforementioned, prime location, within kilometres away from the port town of Lumut in Perak. 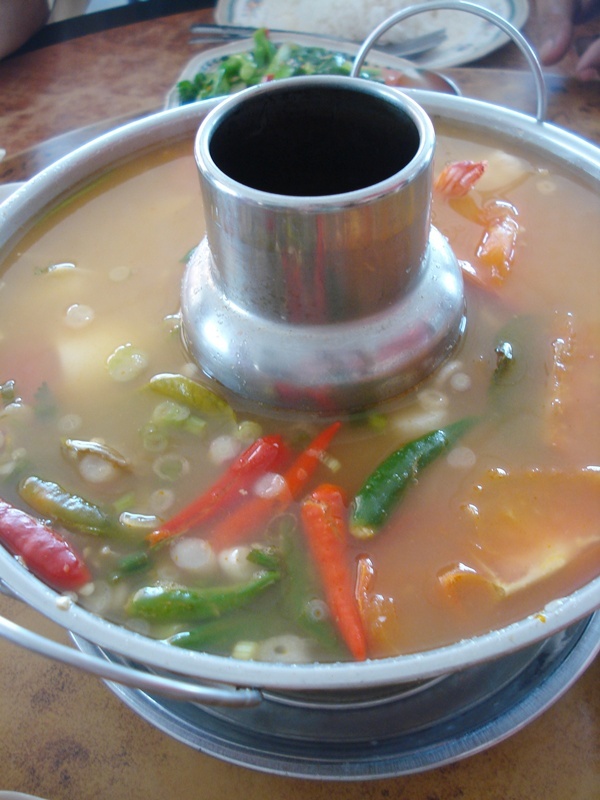 Seafood Tom Yum – And the floating impending threats to the senses! I do realize that I doseldom post reviews on Malay food, with the last post being the rather newly-opened Nasi Padang Simpang Tiga in Greentown of Ipoh. 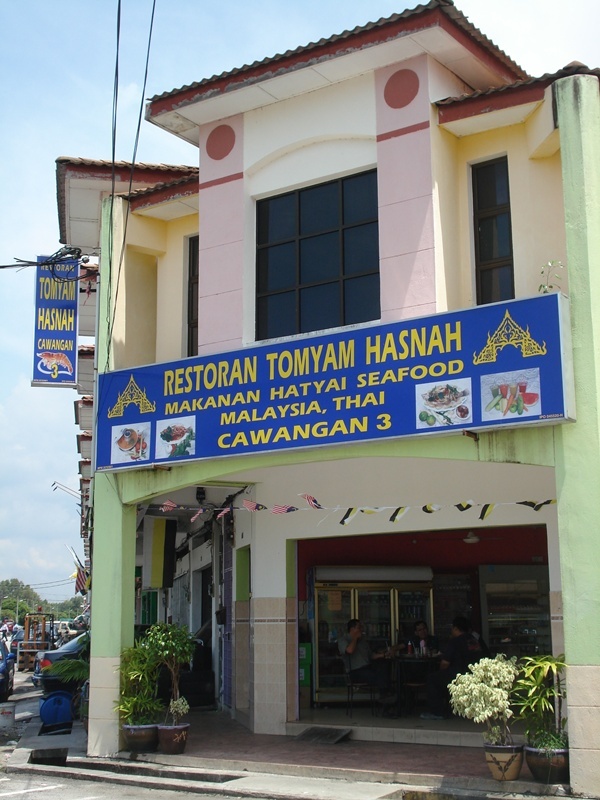 To make amends with regard to that fact, I’ll write about a rather recent outing to Restoran Tomyam Hasnah (thanks to Suzy for the recommendation, and for footing the bill …. =P) in Desa Manjung Raya in Lumut, Perak. This restaurant is situated along the main road of Lumut coastal highway, en route to the town of Lumut, Perak. Point of interest nearby would be the Taman Paya Bakau (Mangrove forest park), which is opened to public for free. The restaurant is supposedly the THIRD branch in a series of Malay-Thai restaurants bearing the same name of Restoran Tomyam Hasnah. There is one in Seri Manjung (location HERE), but not sure about the other. They specialize in Hatyai style of Tom Yam and seafood dishes, mixed with elements and influences of local Malay cuisine. Started off with their signature Tom Yum Seafood, (another option being Tom Yum seafood and meat), which came with shrimps, squids, tangy tomatoes, fiery bird eye chillies, and the like. The sourness of the soup was a notch higher than the usual, but surprisingly, for a restaurant that prides on its Hatyai-style Tom Yum, the spiciness level was tampered down significantly. We did not sweat bucket, nor reached for our glasses of water even after repeated slurping of the zesty soup. This may bode well with those with lower threshold of tolerance to spicy foods, but personally, I like mine with a little more FIRE. 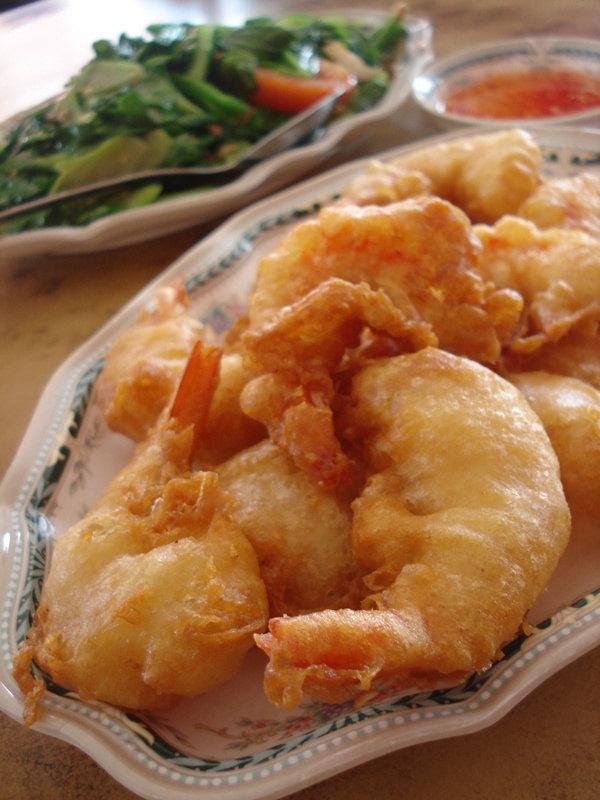 The udang goreng tepung, or batter-fried prawns dipped in Thai chilly sauce was excellent, with the prawns being sweet, firm and very fresh, coated with a light batter and deep-fried to crispy goodness. 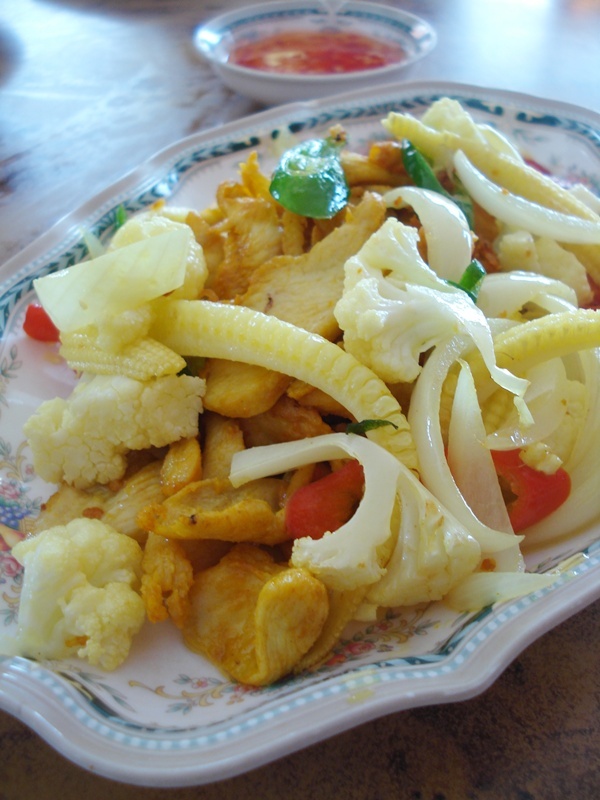 The ayam masak kunyit arrived in a golden hue, thanks to the liberal addition of turmeric powder for seasoning. A little tough, for only lean meat was served. 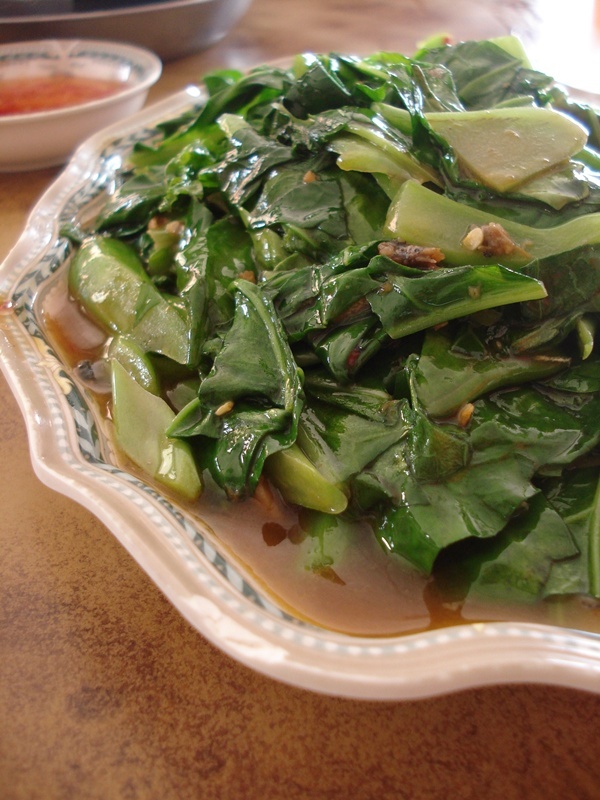 The simpler and more traditional Malay dishes such as kailan ikan masin and telur dadar were passable, albeit the latter was a little oily. Still in the mood for some serious chowing down, we ordered extra plates of Daging masak merah (beef in a sweet and spicy gravy), and finished up with an appetizing (yeah, the irony of it all) serving of kerabu mangga, a tangy ensemble of julienned young mangoes, chopped peanuts,onions, tomatoes and crispy anchovies, tossed lightly with a dash of fish sauce, and lime juice. The meal came to a reasonable RM74 for the 6 of us, including rice and drinks. The other signature dishes from Tom Yam Hasnah is the steamed siakap, or Siakap Tiga Rasa (a mix of spicy, sweet and sour, I suppose), and various other seafood dishes. The crowd may be slightly intimidating come lunch hours, with the blue-collared workers, and factory staff from the nearby industrial park visiting the eatery for some satisfying grubs. Be prepared for some wait when the place is packed. It took almost 20-30 minutes for the dishes to arrive, if i remember correctly. 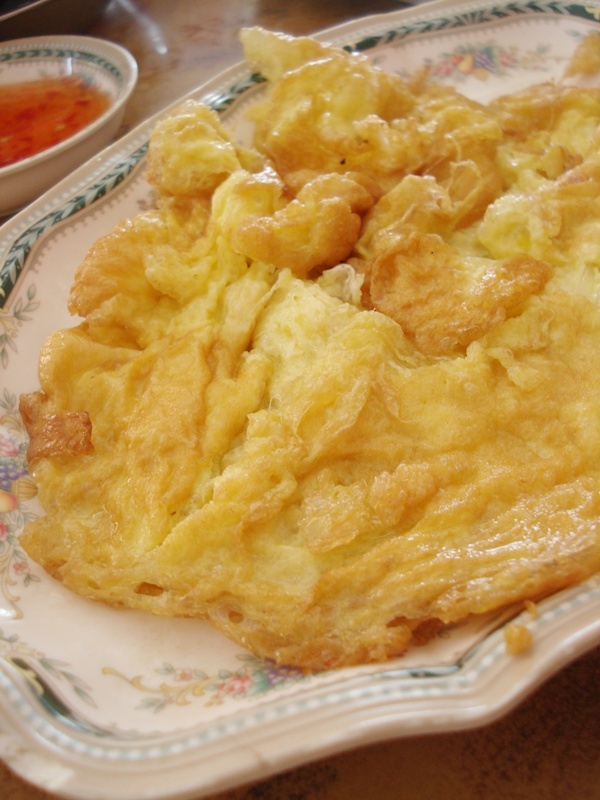 egg omelette must be tasty, but looks very oily….n the kerabu looks a bit bland ya?? yeah, the base of the omelette was glistening by the end of the meal. very, very much lubricated? and the kerabu looked bland, but actually the mango was rather sweetish. 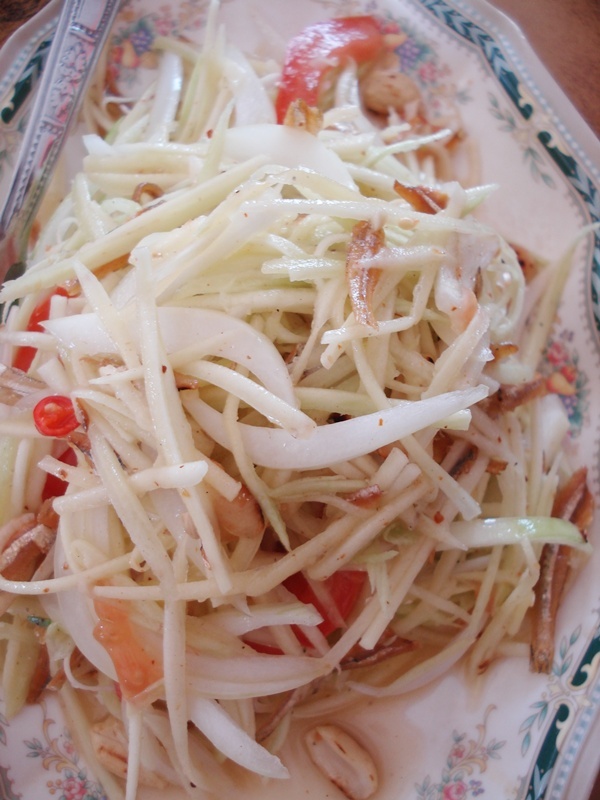 .-= email2me´s last blog ..Danny’s Kitchen, The Hidden Dragon in Solaris Mont Kiara =-. nah ….. the tom yum paste also didnt provide much heat. I prefer my bowl of tomyam to have more omph too! The kerabu mango looks so white, and not green? 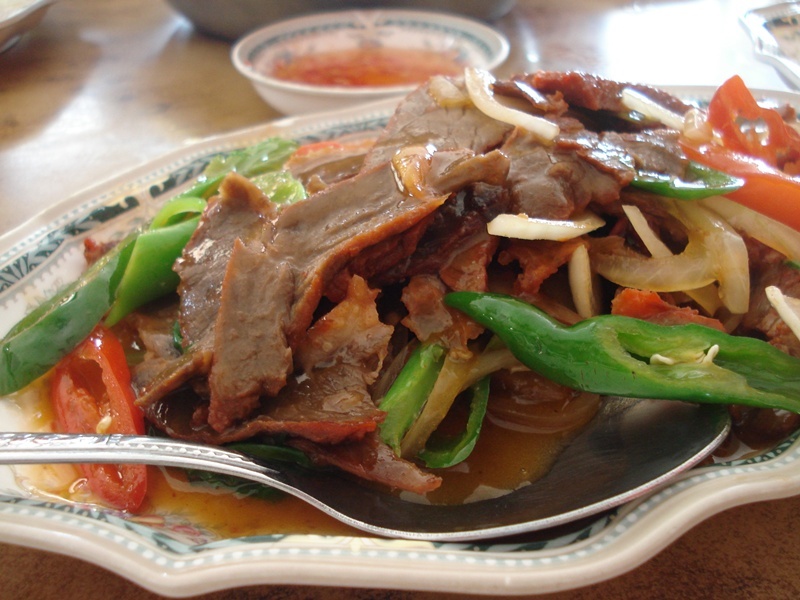 .-= allie´s last blog ..Thian Hoe Restaurant at Gurun =-. yup, not of the green, youngest varieties, i suppose. but sweet and slightly sour nonetheless. venice of perak?! hmmm, wouldn’t that name draw ridicule though, especially if the place doesn’t live up to the comparison? it’s not Lumut, i think. it’s this area, before you reach Lumut. with a residential area as well. the place was populated with Malays and surprisingly, a lot of Chinese that afternoon. I can see they serve quite an average quality of food with reasonable price. is this near the Lumut jetty?? not that near. i think about 10-15 mins away. Of all the food you showed us today. The one attracted me the most is the Udang goreng tepung bro. :p I am itching for some now! yeah, having fresh and succulent prawns coated in a light batter, then dipped into those sweet Thai chilly sauce …. aaahhh… i can have them as snacks anytime. ya me too.. the prawns looked so tasty… Arrrggggggg….. The kerabu mango is whitish. Is it crunchy? .-= Che-Cheh´s last blog ..First Tiramisu Attempt… Failed 😛 =-. but not as sour as most. I’ve never eaten in any restaurants near lumut. Telur dadar! the simplest dish is the best! nope, nothing else. but still, crisp at the sides, and fragrant. a little oily was what holding it back. really delicious pics. the daging masak merah doesnt look “merah” hor? but i can imagine how tasty it is la. ayam with kunyit is kinda cool also. cus here, we only get the goreng-ed version. argghhh! hungry now! not as reddish as most, which bodes well with me. least the tender, lean cuts of beef made it up. hhmm…somehow i nvr fancy those Malay-Thai renditions of thai dishes.. oily and aesthetically- wise less appetising too..
me too. but this one was surprisingly good enough to attract the crowd. not the usual Malay tomyam spinoff, but a stand alone Thai-Malay restaurant. .-= Big Boys Oven´s last blog ..XENRI D’GARDEN TERRACE MIGF =-. but seriously, nothing much has changed in pangkor. how about d price of d foods? how about d price of d meals? camne nak pi tempat nie? Lumut highway, sebelum simpang empat terakhir ke Teluk Batik dan Lumut. Akan nampak sederet kedai di sebelah kiri, menghadapi taman paya bakau. Tetapi, tak pasti sama ada restoran ini wujud lagi atau tidak. Boleh call dulu.